There are about 250 employees working at the Farmer Bros. HQ in Northlake. The coffee company will benefit from cost savings associated with coffee sourcing. A member of the research team tests a small batch of coffee in the R&D room. When you walk in the front door at Farmer Bros.’ new $90 million headquarters in Northlake, it’s as if you’re walking into a coffee lover’s dream. You immediately see the building’s café, which is right down the way from the company’s research and development rooms. 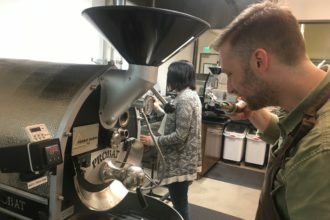 Inside this space, employees are “cupping” coffee—the process the company uses to qualify both the coffees that it buys and the new blends that it’s making. “You’ll see access to coffee all over,” said Mike Keown, Farmer Bros. CEO and board director. The design of the 535,000-square-foot building incorporates plenty of open space and natural lighting, a decision that was intentional and adds another layer to the company’s energy. “If you saw where we came from to where we are now, this is more open, modern, friendly, lots of energy, a totally different feel,” said Ellen Iobst, Farmer Bros. COO. And, the wide-open space leaves the company plenty of room to grow. Originally, the building was slated for about 370,000 square feet, but midway through planning the growth opportunities were realized and Keown said a decision was made to make the building larger. The company received both Northlake and Denton County economic development incentives, but Keown said that, in the grand scheme of things, “the incentives were a relatively small part of” the move. 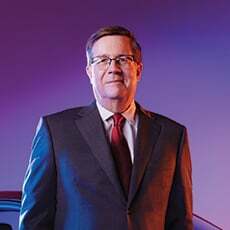 Instead, he said the company’s nationwide search—which looked at a corridor from north Houston up to Oklahoma City—had more to do with the intangibles: “The big drivers of the move were having good neighbors. We were very impressed when we met with leadership in Fort Worth and Dallas, and certainly in Northlake. The new location will be able to roast anywhere from 24 million to 28 million pounds of coffee a year, and can store 16 million pounds of green coffee beans (in their pre-roasted form). There are currently about 250 people working on-site, a number the company says will increase to about 300 once all is said and done.